Sit on a spinning chair with a weight in each hand. Draw your arms in and out to change your speed. 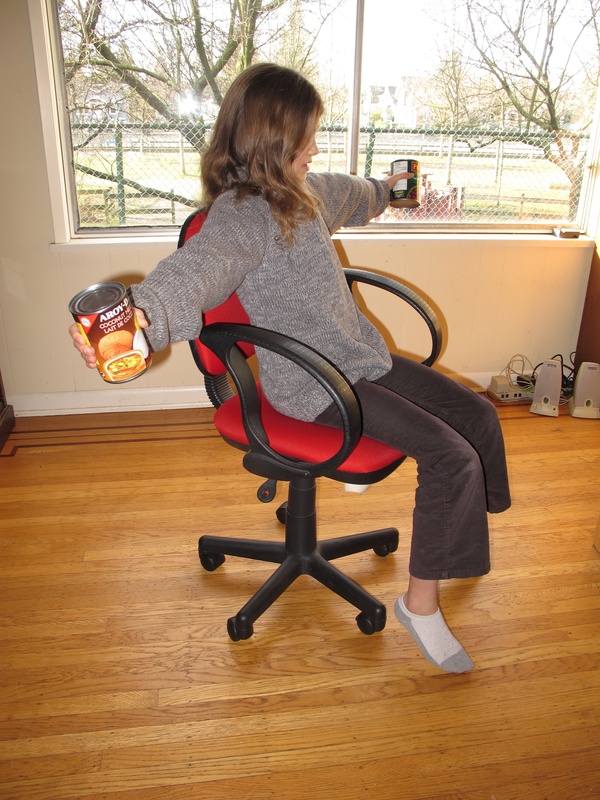 Hold the cans in outstretched arms, and ask someone to start the chair spinning (or spin it with your feet). It does not need to be going super fast. Bring your arms inwards, and feel yourself speed up. Play around to experiment with the forces you are experiencing. When the heavy cans change place, the speed of the chair spinning must also change. This is because the amount of force stays the same in the whole system (the chair, you and the cans). With arms outstretched a lot of force is needed to move the mass at the end of your arms, so there is less force to turn the chair. When your arms are pulled in it takes less force to move the weights, so more force can go into spinning the chair and it spins faster. A rotating object has a constant angular momentum (unless it is acted upon by an outside twisting force). Angular momentum is the product of angular velocity and moment of inertia. Angular velocity is velocity measured in degrees. Moment of inertia depends on both the mass of an object and on how that mass is distributed. When the mass moves inwards the moment of inertia decreases, so the velocity increases. Discussion on sports: this phenomenon is why an ice skater or a dancer doing a pirouette draw their arms and legs in to spin faster. Also used by divers or gymnasts when they go into a tuck position to flip or twist at a faster rate.